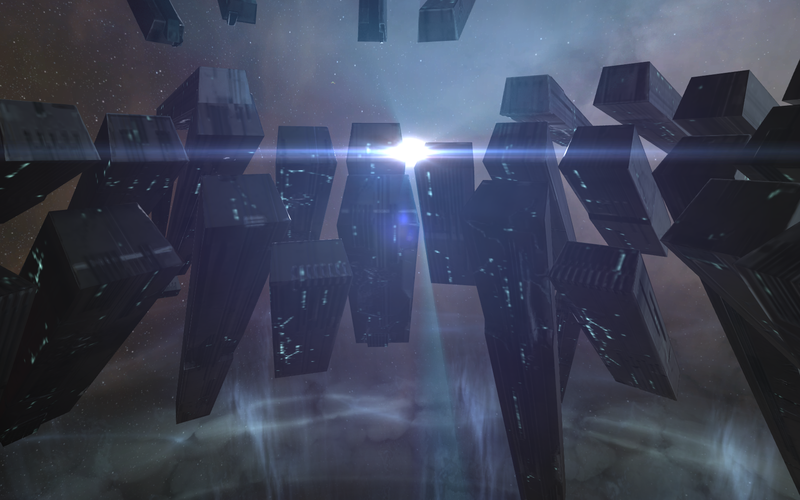 Say what you will about the Amarr (and trust me, I could say quite a bit), but they do know their pomp and pageantry. 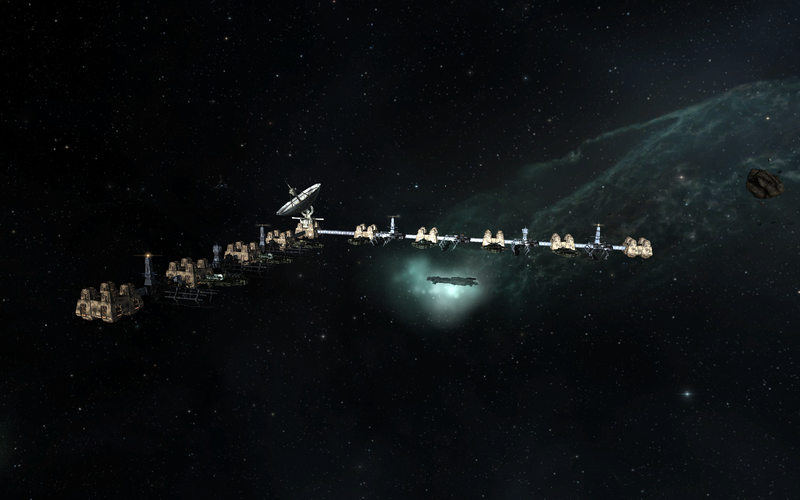 Their ships and stations bring the art that is space architecture and design to a whole new level. 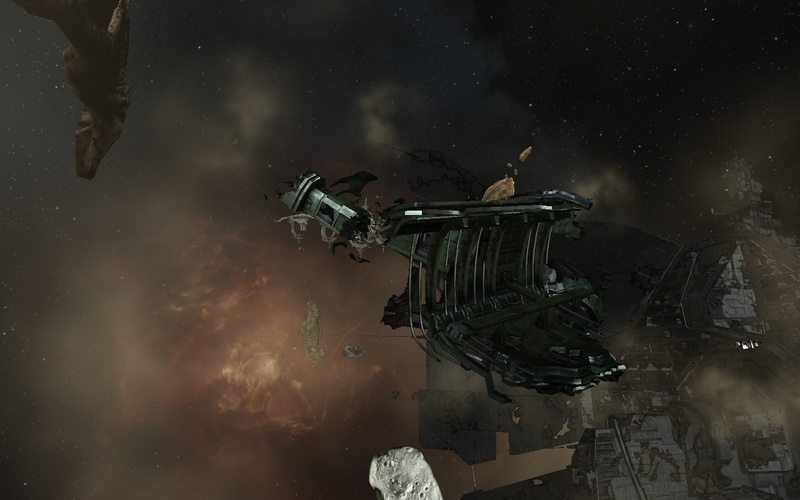 I would say that they have overly prioritized form over function, but the fact that they stand as the premier military power in New Eden suggests otherwise (assuming the Jove are as dead as they appear and ignoring the Drifters…). 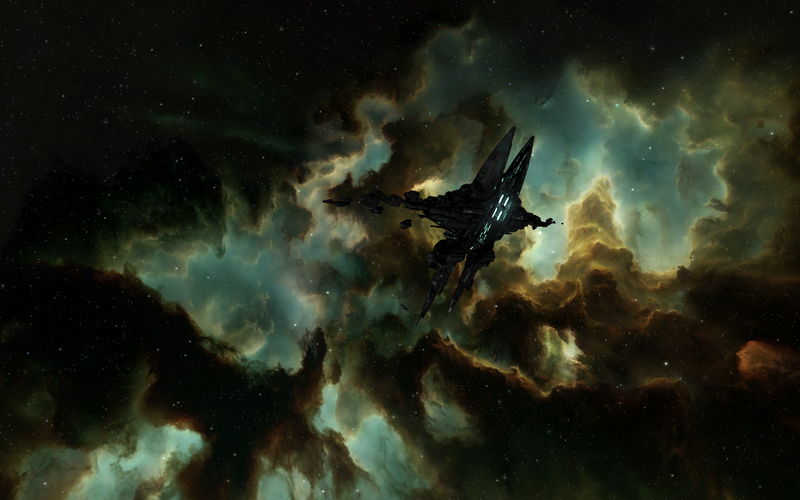 Although I have never quite gotten the hang of flying Amarr ships myself, I have always admired their graceful lines and glorious golden hulls that make my preferred ships look they just escaped from a trash can somewhere. And, obviously, if you’re looking for a lot of pomp and circumstance in swearing in a new leader, look no further than the Amarr Empire. Unfortunately, due to a previously-planned engagement, I was forced to miss the grandest example of Amarr pomp and circumstance in recent memory: the coronation of Empress Catiz I. Granted, it was to take a long-planned vacation (it never hurts for even empyreans to reconnect with their planet-side roots every now and then), so it’s not like I didn’t have some compensation for missing the coronation, but I was still somewhat bemused to miss the it, if only to make sure that the Drifters didn’t make another appearance at an Imperial event. But at least I was missing the coronation for a good cause. I would just have to cross my fingers and hope I didn’t miss anything too exciting, while keeping an eye on GalNet every now and then. I went on my vacation and had a delightful time, the coronation seemed to have gone relatively smoothly, except for a few minor surprises here and there, and honestly, I had assumed that that would be that. 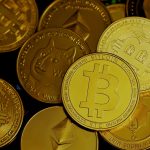 A few weeks after returning from my vacation and re-settling to non-vacation life (always a more difficult transition then I’d care to admit), I was finally catching up on a market run I had been meaning to make for a while now. 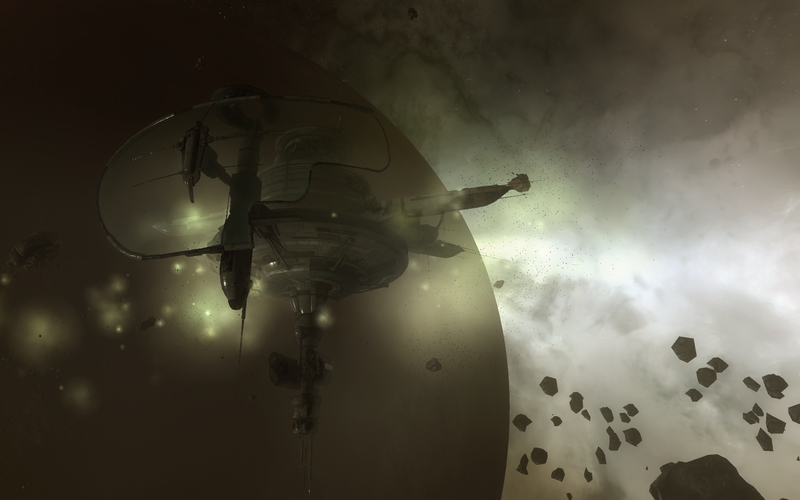 I undocked my trusty Viator-class Planet Express Ship and made my way to my closest market hub, Amarr Prime. It wasn’t until after I had finished my business and I was preparing to leave Amarr that I noticed something on my sensors. Having flown to and through Amarr countless times, I hope I can be forgiven for not necessarily paying as close of attention to my sensor returns in the system as I might normally do. Been there, done that, so to speak. However, if I hadn’t given even a cursory glance to my sensor returns, I might have missed that Aura was detecting a new beacon in the system. My curiosity duly piqued, I warped away from the jumpgate and over to the Empress Catiz I Honor Guard that Aura had discovered for me, not quite knowing what to expect. As I dropped out of warp, however, it became clear that Catiz had never officially dismissed the Honor Guard that escorted her to her coronation and, like good soldiers, they had remained at their posts until instructed otherwise by their leader. It was certainly an impressive display of Imperial might, all the more so because what was surely a merely ceremonial honor guard was able to field 12 Avatar-class titans, along with countless other capital vessels and battleships. I was even able to spy one or two of the new Apostle-class force auxiliaries that are a relatively recent entry into the ranks of Amarr capital ships. 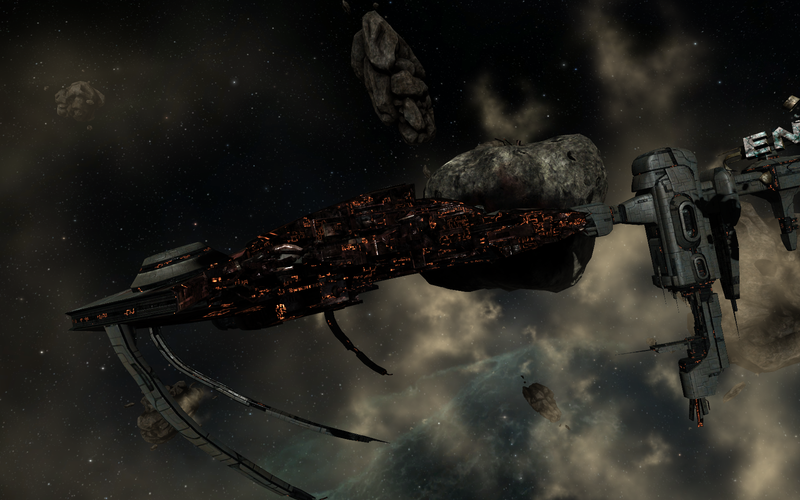 And these were apparently ships that the Amarr Navy was content to just leave lying about. There is a reason that the Amarr are commonly considered to be the strongest of the four empires, and its displays like this that prove just how right the conventional wisdom is in that regard. Needless to say, I felt a bit like a kid in a candy store in having the chance to examine most of these graceful yet powerful vessels up close. As I had mentioned, I always appreciated the artistry that Amarr ship designers brought to spacefaring ships, and seeing them all arrayed in perfect precision is definitely a sight to behold. From Avatars to Armageddons, many of the most iconic Amarr ship designs could be seen standing at parade rest, ready and waiting to serve the new Empress. It was enough to send a chill down my thoroughly-Gallente-loving spine. Indeed, I spent quite a while just wandering up and down the rows of ships, trying to notice all the details and structures that the Amarr have built in to many of their ships. I may never agree, even with the new Empress, with the vast majority of Amarr policy, but I will say this: they sure know how to put on a show. Potential Hazards: If you’re below a -2 in security status, or -5 standing with the Amarr you’ll have to deal with some rather unpleasant policemen. While my space-based life is a fairly solitary one, when I’m planetside I tend to be a bit of a social butterfly. 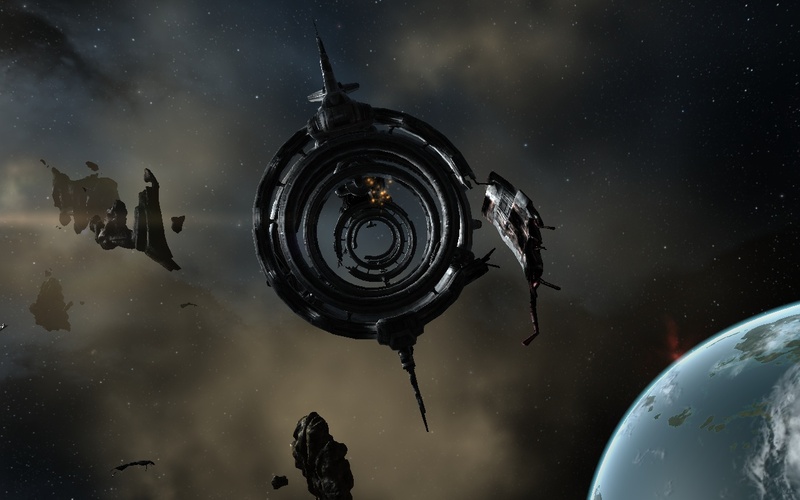 I’ve talked to capsuleers from all walks of life, from fellow solitary explorers to those who are at the heart of the nullsec battles that the interstellar media love to cover. 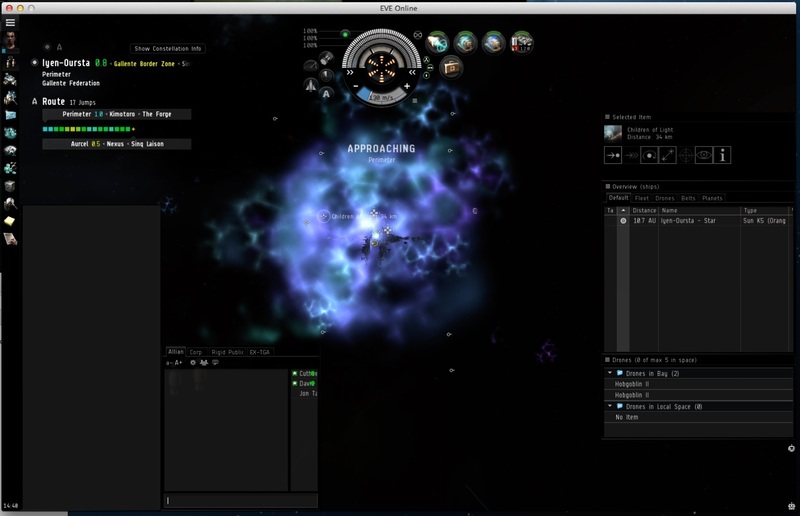 I’m often struck at just how regimented a null sec pilot’s life can be when in one of the larger capsuleer alliances. Regardless of any planetside concerns, you’re supposed to available and on-call as often as possible for potential flare-ups with other alliances and other operations. Some alliances can require certain minimum participation requirements and those who are particularly poor at flying can even be booted from their corporations or alliances. All of these requirements and schedules seem like a bunch of pressure to me, and I’m often quite happy that I have to deal little with that regimented life. The Sleeper device is dwarfed by not one, but two large maelstroms. So it struck me by surprise a few days ago when I was contacted by a fellow explorer that it would be well worth my while to join a fleet with the simply-named Consortium to dive into the Drifter hives yet again. The time was generally a few hours before I undocked after returning from planetside activities, but after raising my eyebrow at the closest thing I’ve received to an order since becoming a capsuleer, I agreed to show up at the appointed time. Before I even had time to eat after returning from the nearest planet, I found myself undocking and racing to meet the rest of the fleet, in a standardized fit Caracal, no less. But with little info to go on other than a promise that I would be well-served to attend this fleet, I joined up with my fellow pilots, a collection of friends and other explorers that I have grown to know quite well. I chuckled as I was initially slotted in as a squadron commander, as putting me in any kind of leadership capacity tended to not end very well. 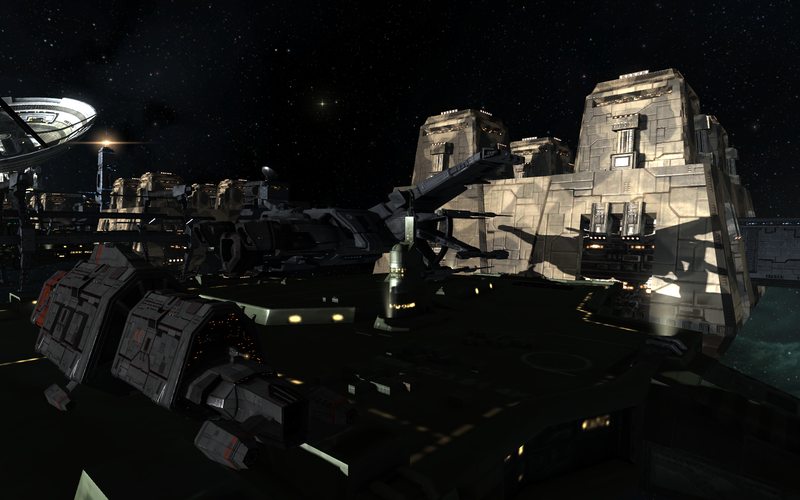 The small dot near the center is a Buzzard-class ship for scale. The initial dive into the Barbican complex was remarkably similar to what I recall during my initial foray into the Hives. Indeed, nothing seemed out of place as we progressed farther through the Hive, and I began to wonder what, exactly, I was supposed to be looking for. That is not to say that there was nothing to see, of course. The Drifter and Sleeper structures sprinkled throughout the Complex continued to dazzle me, and I was told at least once to stop taking pictures and keep my eyes on the various Sleeper and Drifter drones before they blew me up. After reminding them exactly who they had recruited into their fleet, I did refocus my attention on the various Sleeper and Drifter vessels, though I still managed to sneak a few more pictures along the way. Many of the arms appear to have snapped over the aeons. Finally, after a fairly smooth operation, we made it to the Barbican hive. Telling me to pay attention to the site and not the views ended up being fairly prescient when I ended up losing my Caracal after a few broadsides from Hikanta Tyrannos, and my feeble instincts of not remembering to broadcast for reps until it was much too late. I looked on in dismay as my pod was summarily expelled from my disintegrating ship, but thankfully Hikanta chose to ignore me afterwards as I looked around the rest of the Hive. The only noticeable change that I was able to see was that the Hive had taken on rather more of a greenish hue than I had previously remembered. Certainly there was nothing here that really attracted my attention as particularly noteworthy, even if the company and sights were still enjoyable. 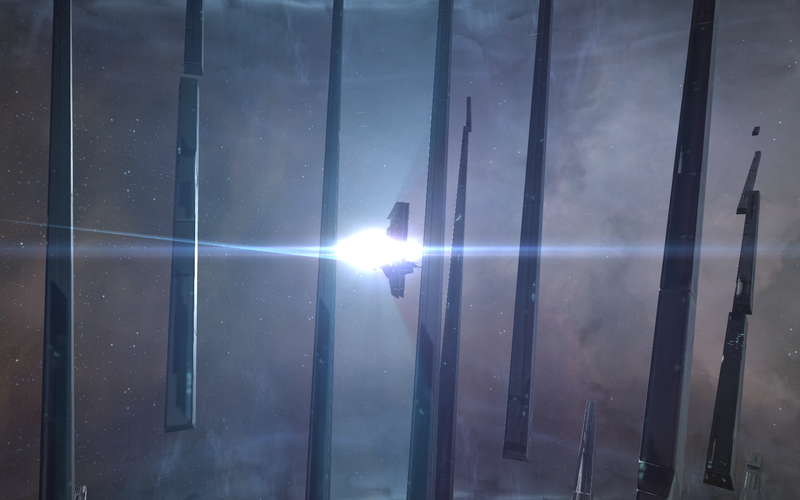 Flying through the structure was often an eerie experience. At this point, seeing that there was no other way to view the alleged Noteworthy Site, we were told to reship into the fastest vessel available, as we had a bit of a slog ahead of us. Thankfully, I had brought Professor Science with me to the fleet rendezvous, and after flying back in my pod to pick it up, I returned to the Barbican system. I had never fit the good Professor for speed in particular, but I felt that it’s 2.5 kilometers per second (with microwarpdrive active, of course) would at least be respectable. We arrived back at the site, and headed in the indicated direction (from the second room, we were told to head directly towards the now-bookmarked Hive). After finally getting out of range of the local Drifter forces (which took ages at sub-MWD speeds whilst cloaked), I was able to finally push the Professor to full speed… just to watch everyone else in fleet zoom past me, clipping along at 7-10 kilometers per second. Some of the arms showed signs of age or damage. Left in the metaphorical space dust, I was left to my own devices for the next 45 minutes or so as we trudged over 10,000 kilometers to the site. 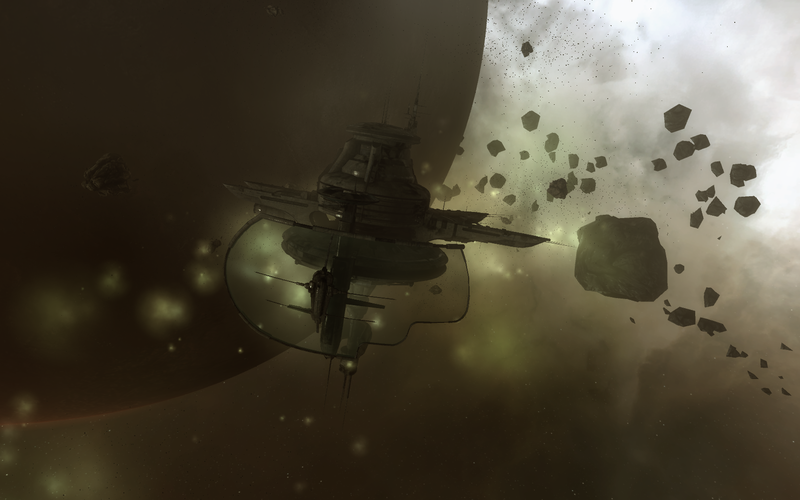 Being smackdab in the middle of a deadspace pocket, it wasn’t even possible for the faster fleet members to arrive at the site, bookmark it, and warp out to the rest to drop off the bookmarks; anyone wishing to see this site has to take it the long way. Perhaps the one silver lining to be in such a relatively sluggish vessel was being able to listen in as other pilots raced ahead and first came into view of the new site. Whatever it was, it was apparently impressive, as reactions ranged from startled gasps to yells of disbelief, with quite a few expletives thrown in for good measure. As I picked up the tail end of the fleet, merrily going along, I couldn’t quite help but wonder if this thing wasn’t just getting hyped all out of proportion. Then it came into view and I immediately understood what everyone else was saying. It’s almost impossible to describe the truly awe-inspiring scene that rather abruptly resolved on the Professor’s sensors (I wonder if rather than me, the fleet should have included a poet). Infront of me stood a large… pointy thing. Well, large is an understatement. Final measurements appear to put the structure at over 200 kilometers across on its largest axis, meaning that it has bigger dimensions than even the Jovian observatories. Needless to say, it put my tiny Professor Science to shame. The structure appeared to have two rough halves, with spindly arms extending straight out from a top or bottom ring. The arms themselves, despite being dozens of kilometers in length, were relatively skinny. Though a standard Sleeper gray, portions (I hesitate to say “windows” or “portals”) of these arms also had a greenish glow to them. Aura was of no help identifying the device, noting that it was only an Unidentified Sleeper Device. Somewhat oddly, despite only recently appearing (to our knowledge, at least), portions of the arms also appeared pockmarked, while other arms seem to have snapped liked twigs on the proverbial tree. 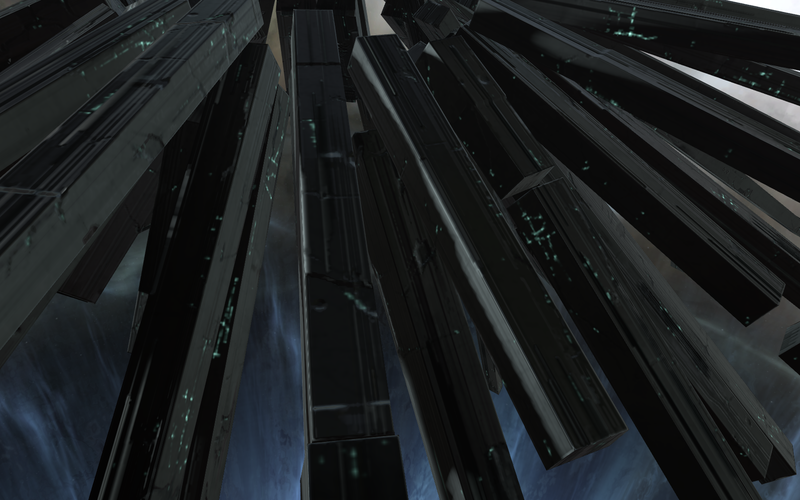 Unlike the damaged Sleeper enclaves that could be found near the Hives, these only appear to have been damaged by age and exposure to the elements, but they do give the structures a more aged appearance than we’ve really seen so far from the other Drifter or Sleeper constructs. The structure is over 200 kilometers across. I was so entranced by it that it took me a few minutes to notice that the spindly structure was not all that there was to see. Both directly above and below the structure (relative to the system’s ecliptic, of course) were two large, swirling maelstroms of energy. Glowing with a mysterious blue energy that reminded me strongly of the spatial rifts we can see in the Sleeper epicenters, the energy present spiraled slowly inwards towards a central point in each maelstrom. If these truly were large whirlpools, what the energy was being sucked in to was not at all clear, other than some large, white, glowing mass in the center of each. Towards the fringe, each vortex took on an almost cloud-like appearance. Exactly what caused them were completely unknown, but considering that it lined up with the axis of the center rings of the spindly structure, the whirlpools were undoubtedly related to the mysterious structure. Whatever the Sleepers were doing here, it was having quite an effect. Despite certain arms appearing bent or snap, there were no signs of damage at the ends. I spent more than an hour spellbound by the mysterious Sleeper device and its environs, and spent much of it running up and down the various arms, just to see if I could find any further clues. Unfortunately, there is little that can be divined from a purely visual inspection, and instruments are of little to no help right now. But a dearth of evidence has never stopped speculation from running rampant, with some even suggesting that it was a map of some kind. But I remain unconvinced of most of the theories we’ve seen so far, since we need to first know exactly what the energy vortices are for first. Figuring those out may well be key, even though attempts to approach them have, as of yet, proven fruitless. That being said, investigations will undoubtedly be ongoing, and I have no doubt that any changes in these structures will be reported widely. The structure has many mysteries yet to reveal. Finally, however, the long day began catching up to me, and I regretfully turned my ship towards home. I was even more reluctant to leave, given that once I warped back, even with a bookmark, I would be stuck making the 10,000 kilometer trek back to see the structure again should I ever want to visit (unless the Sleepers are kind enough to install an acceleration gate of some kind to the area, of course). 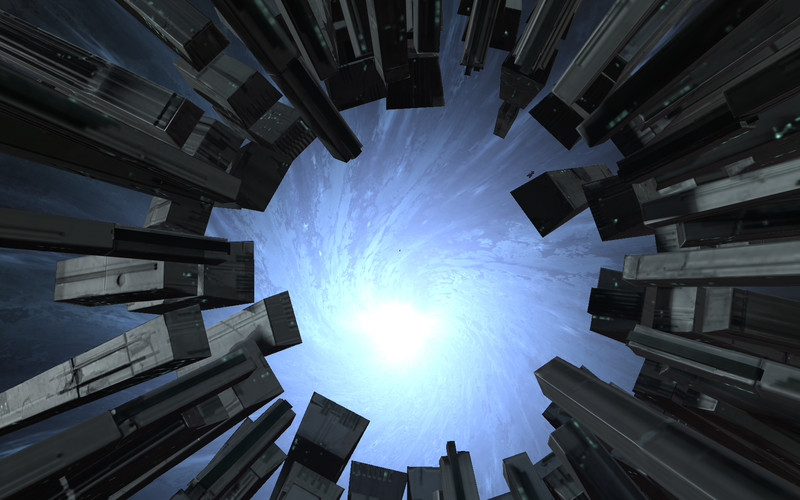 The joys of deadspace physics, if you want to call it that. But as the structure shrank to a pinpoint and disappeared behind me, the spindly arms seemingly collapsing into the rear of my warp tunnel, I got the distinct feeling that even though the mysteries surrounding these structures seemed almost impenetrable now, we would be learning details of them much sooner than we might think. Additional Notes: As of now, the only way to discover these devices is to fly in a straight line from the ‘lobby’ or ‘split’ of the complexes towards the complex’s hive. The device will be found roughly halfway between the two rooms, about 10,000 kilometers from the ‘lobby’ and 10,000 kilometers away from the hive. The device appears to be in the same location relative to the rooms regardless of which Drifter complex is visited. The wreck of the Planetary Colonization Office. To say that there have been a lot of happenings in the past year is probably a bit of an understatement. Since the arrival of Caroline’s Star almost a year ago, I feel like I have gotten whiplash just from trying to keep up with all of the news both in and out of the Cluster in recent months. Caroline’s Star only heralded the beginning of an upheaval in the normal order that we are still trying to comprehend. 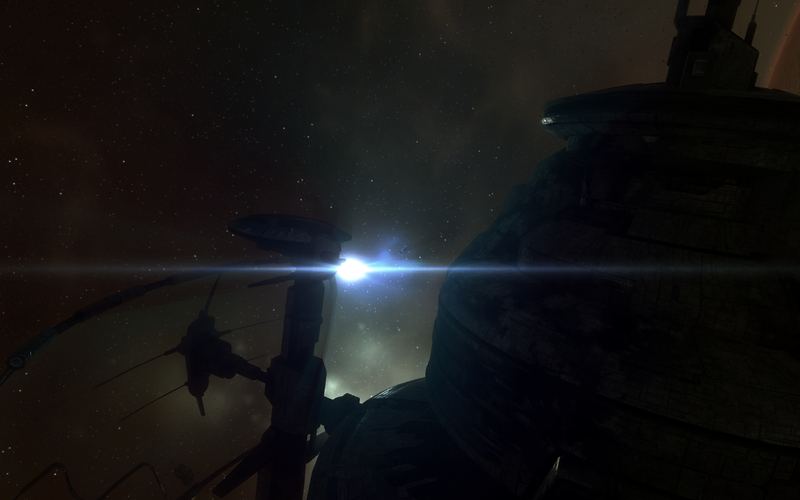 But what I fear has been forgotten in all of the hub bub, especially since the arrival of the Drifters (whom have understandably taken the bulk of researchers’ attention since their arrival in New Eden), is where this all started. Thera was one of the first of the new Anoikis systems to get introduced to the wormhole… network, for lack of a better term. And after the shock of the discovery of the Sisters of Eve’s colonization of the system has worn off, it seems to have mostly faded off the radar for many of us interested in the mysteries of the Cluster, especially as the Drifters and various Hives have taken center stage. Thera peeks through some of the still-remaining solar shielding. But that’s not to say that we should forget about Thera. As I have said recently on the subject at a side presentation of the 95th Interstellar Mindclash Championship at the Grand Tiegjon Resort and Casino, I don’t think we’ve discovered even half of what makes Thera special. The Sisters of Eve were intrigued enough to dedicate significant resources to the system, building eight stations in the system dedicated to various research and logistical purposes. They wouldn’t have dedicated so many resources to the system if they hadn’t found something of particular interest. And frankly, whatever the Sisters’ find that is of interest to them is probably bad news for us capsuleers, given their natural antipathy towards us. A greenish debris cloud surrounds the wreck. Of particular interest to me these days is the focus of the research labs that the Sisters have established in Thera. Although some stations got destroyed when Thera suffered a… main sequence event, the stations on the fringes of the system all survived, and their primary research purposes are telling. The surviving Sisters stations include the Institute of Paleocybernetics, the Surveillance Observatory, the Fullerene Loom, and the Applied Gravitation Laboratory. Of particular interest to me was the Institute on Paleocybernetics, which to me implies that they found something of interest in one of the planets of the system, before being pulverized by the blast that caused the inner planets to shatter. This is further backed by the fact that one of the now-wrecked stations in Thera is the Planetary Colonization Office. Sleeper drones can often be found near the wreck. Perhaps the saddest testament to the shattered dreams of the expedition to Thera, this wrecked station seems to have been established as a coordinating center for the colonization of the planet it orbits. As Thera VIII is shattered and wracked by titanic quakes, such an effort would seem improbable unless the shattering happened relatively recently. 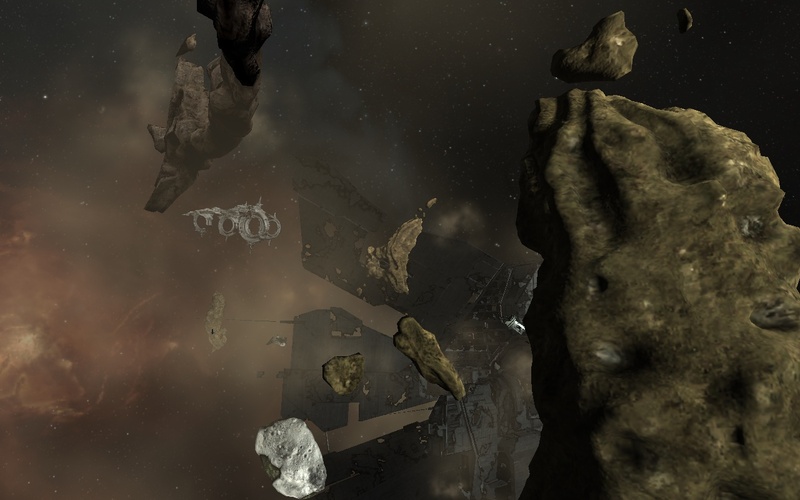 While the damage to this station is extensive and very little survives, there are large storage areas containing bins of rock samples that apparently originated from a geologically stable barren or temperate planet. Still, the fact that the station existed at all suggests that the Sisters were focused on establishing planetary colonies in Thera, an unusual step for the primarily space-based Sisters. This unusual focus on the planets in the system, along with the Institute of Paleocybernetics, set my mind racing as to what the Sisters could have uncovered in the years since they first discovered Thera. Clearly something Sleeper related, given what we’ve seen of the system and the Sleeper’s expertise in virtual reality and neural interfacing, but what if they knew something about the Drifters before the rest of the cluster and refused to warn us? How many lives could have been saved? How much chaos could have been avoided if not for their urge to keep all of their findings secret? If we ever do find out what they discovered here, I suspect us capsuleers will be learning the hard way just what they found. Either way, though things seem quiet now in Thera, keep your eye on that system. I don’t think we’ve discovered even half of the secrets it holds. Yes, I’ve been a terrible blogger lately. TO BE FAIR, though, the past week or two has been dedicated to FINALLY pushing out version 2.0 of the Lore Survival Guide, and I’m delighted to announce that it is finally up in PDF format! Please feel free to send me any questions, comments, or concerns you may have. You can find a plain text version, a version with pretty pictures, or a version that shows the changes from version 1.5.1. Industry is a mystery to me. There, I said it. Oh, sure, I get the broad concept: gather the components, get a guide to put those components together, push button, receive bacon ship (or module, or ammo, or…). But, as always, the devil is in the details. Even just a glimpse of some of the data that serious manufacturers must wade through in order to make a profit gives me a headache. I’m not one of those people who thinks that mining an asteroid will give me the ore for “free”, but asking me to value those items will often result in a blank stare and, if we’re lucky, a number of some kind. But this is not to say that I have a deep appreciation for manufacturers. It might all be gobbledygook to me, but that gobbledygook results in almost anything that I may ever need while flying around New Eden. I simply don’t understand it, and I accept that I don’t understand it. More power to those that do. Although industry is a mystery, that doesn’t mean I can’t appreciate its beauty. Nowhere is that more apparent to me than a bustling shipyard. There is a special energy here; one that you can only find in the throes of creation and skill. From skeletal hulls to nearly complete space vessels, it’s fascinating to watch a ship grow from the bottom up. Everyone you talk to takes a special pride in their work. And how could they not? Spending so much time and passion on a hull imbues it with part of their own energy. I’ve heard of some people calling their ships their children, and I have no doubt that they actually view it as such. Even if the vast majority of the vessels produced are doomed to be destroyed, that doesn’t mean that workers won’t put in as much care as they can to ensure the vessels go down fighting. 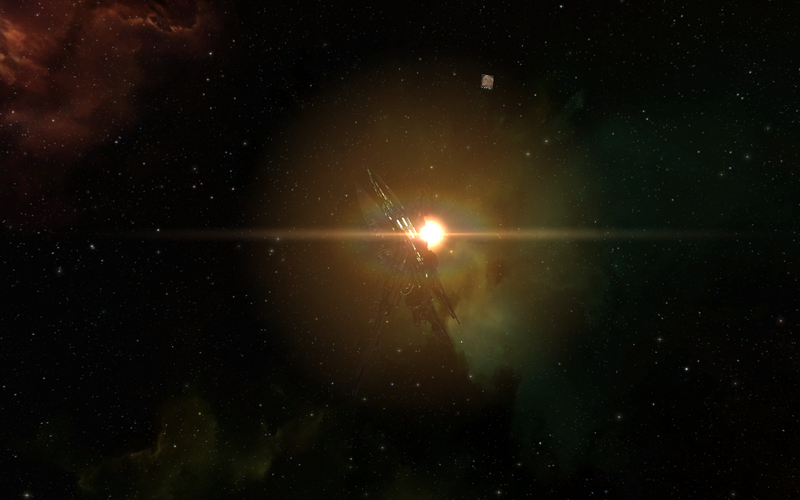 This small compound acts as a fleet staging point, relaying squads off to their deployment locations inside Black Rise or housing them on their way back to State heartlands. 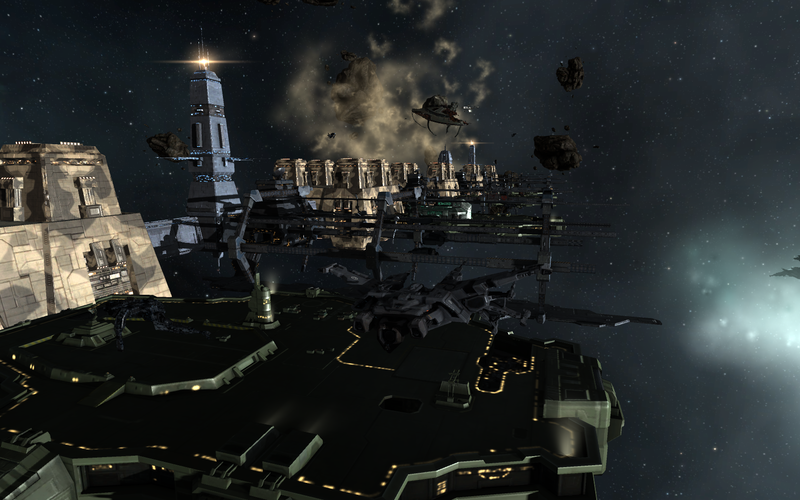 Various Caldari Navy officials make this place their temporary home, and Astoh itself is rumored to house some of the higher-ranked officers involved in daily operations across the war-torn region. The shipyard itself is fairly small in size, but bustling nonetheless. Seven drydocks comprised the bulk of the site, with ships in varying stages of completion. Unlike some of the other shipyards I’ve seen recently, the Astoh yard seemed to specialize in subcapital vessels. A few Caracal-class cruisers and as well as a Scorpion­-class battleship or two were under construction at the time I visited. Some were barely recognizable, either undergoing heavy repairs or just starting out as little more than a keel. Others were clearly nearing completion, with drones and various workers scurrying around its exterior. Each of the drydocks had attendant facilities attached, acting as worker housing and support, protection, entertainment, and all the other facilities necessary for this small city in space. 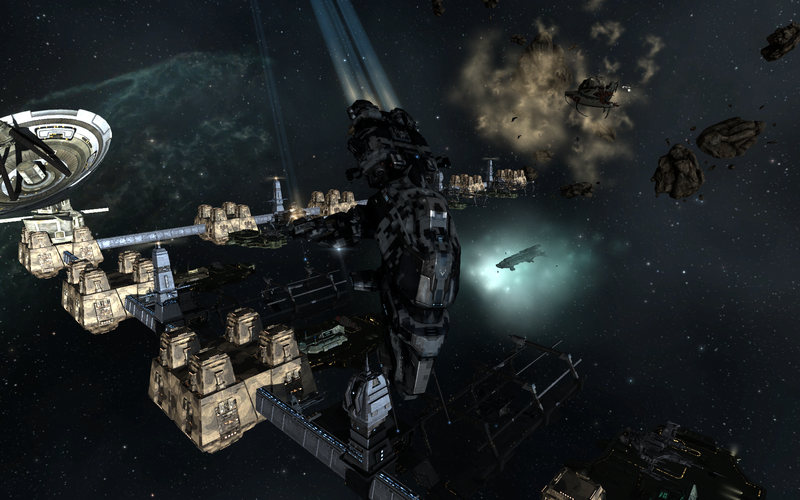 Beyond the drydocks themselves, the Caldari Navy had send some serious protection to protect the workers and the facilities here. A number of cruisers and frigates scurried about, patrolling the outer edges of the shipyards against all intruders (though, oddly, not giving me a second glance). A few battleships also lumbered about. 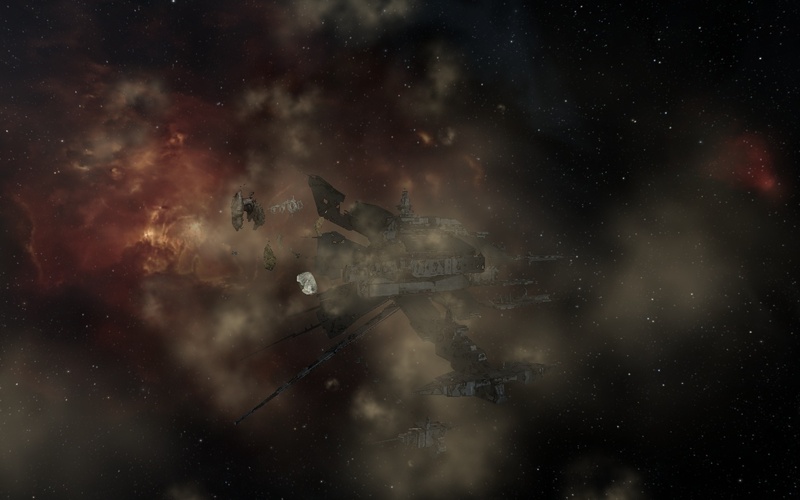 But the best indication that the Caldari considered this site one of significant strategic value was the Chimera-class carrier that acted as the flag vessel of the fleet. Sitting in the middle of the shipyard, like a mother hen guarding her chicks, the carrier kept a watchful eye over all other activity in the shipyards and beyond. Always a bold one, I flew Professor Science right up to its hull, as always goggling at just how much capital ships dwarfed my little ship. A small distance off from the main facilities sat an old, drifting wreck. Perhaps the old station, with attendant-and-still-sparking Quafe sign, indicated a different past for this particular deadspace pocket. But given the severe deterioration of the station, the past has very much been left behind. 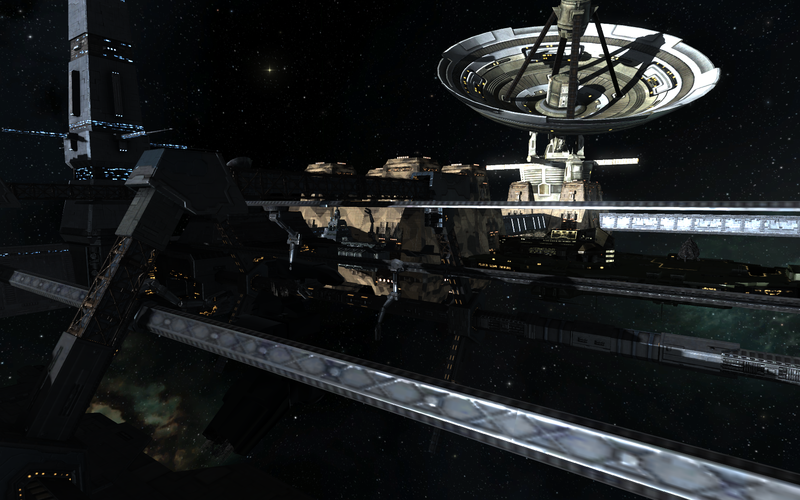 Oddly, the few remains of station superstructure look almost Gallente in origin. The graceful curves and organic feel was distinctly non-Caldari in design. But a Gallente station in Black Rise, particularly an old and decrepit one, made little sense given that Black Rises was only disclosed to the rest of the Cluster (including the Gallente) only a few short years ago. The station remains certainly raised a number of questions, but as is often the case, this seemed to be a mystery that I would not solve any time soon. I stayed at the site for quite a while, watching the ebb and flow of the workers, machines, and security vessels as they all worked together to create and build these gorgeous ships that we fly every day. 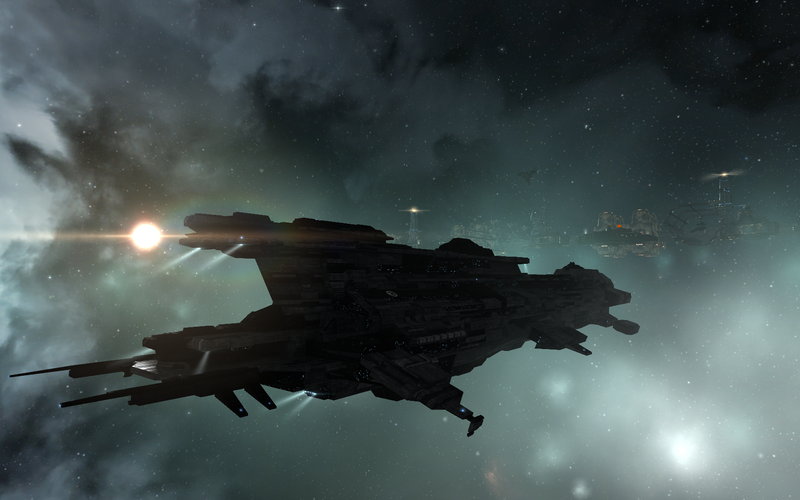 Although these ships were to be used by the Caldari Navy, an entity that does not exactly have my best interests at heart, I still admired the sense of professionalism and efficiency I saw in the shipyards. The carrier at the heart of the shipyards was a truly stunning vessel; I was reminded again of the odd beauty that Caldari ships had, even if it was not a design that I would have thought of. 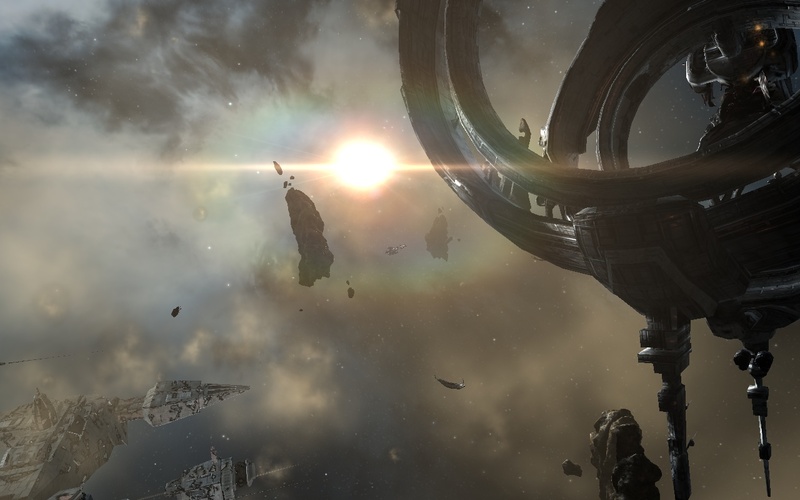 In fact, I seemed to have an odd fondness for Caldari aesthetics: despite being a proud Gallente citizen, almost of my ships (and certainly the ships that I flew most often) were Caldari in origin, suggesting that the odd asymmetries and harsh edges appealed to me in an almost visceral manner. Finally, I banked the Professor on an exit vector. As the warp tunnel formed around me, I was once again amazed at the thought and design that had to go into building even one of these vessels. I have absolutely no idea how people are able to juggle this on a day-to-day basis, but I guess that’s why no one pays me to. Potential Hazards: If you’re below a -4 in security status, or -5 standing with the Caldari you’ll have to deal with some rather unpleasant policemen. The universe just isn’t fair sometimes. If the universe knows anything about me, it’s that I live for the visuals. I am willing, happy even, to travel for hours on end, risking ship and limb, to see something and write about it so others don’t have to. I pride myself on careful research on sites, so I can offer informed explanations, giving both context and meaning to the sights that I see. I work hard for what I do, and it’s all for the sake of that one shining moment, that first time the view clarifies in front of me coming out of warp. That sense of wonder as I see something for the first time. Sometimes, if I’m lucky, I know what to expect. But other times, I’m going into the true unknown, which makes that first sight all the more thrilling. With all of this in mind, you would think some sense of cosmic karma ought to be working in my favor. But no, of course not. 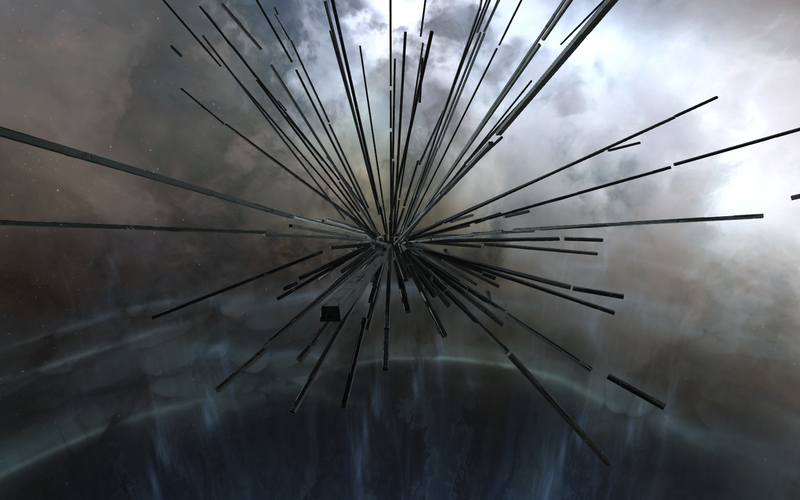 I forgot for a split second that I was in New Eden and that the laws of the universe were tipped very much against me. The story here begins in Iyen-Oursta. 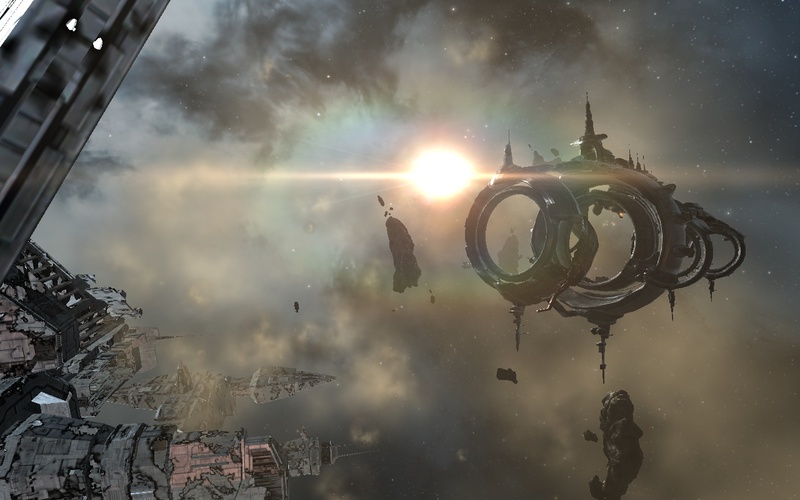 It’s a rather unassuming system on the Gallente-Caldari border, a front often forgotten given that Algogille and Luminaire are already so close to the border, and thus bear the brunt of any defensive and offensive posturing. I’ve flown through it many times, and have even flown over just to enjoy watching the Roden Shipyards in system build up its fleet of Megathrons. 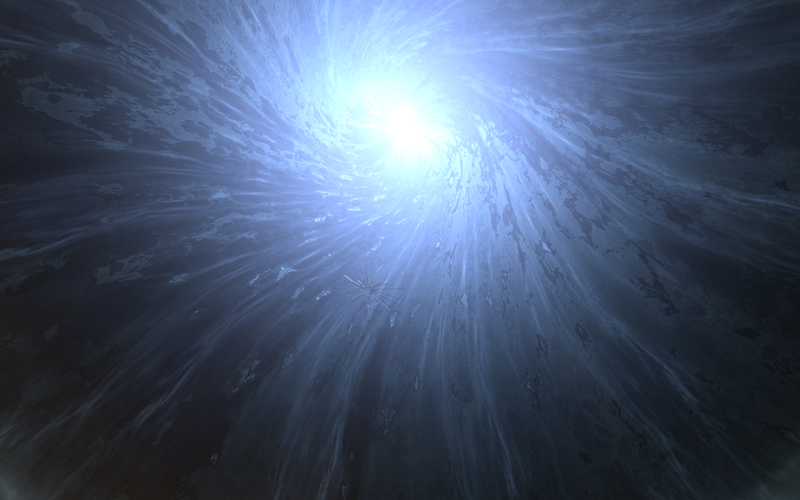 Early on in my career as a capsuleer, I came across reports of something called the “Children of Light.” Reports were few, but fairly straightforward. There had been reports in the past of clouds of light converging on the gate at activation. The scientific consensus seemed to be that the discharge was most likely due to some kind of plasma leak that, in certain conditions, formed a resonance with the jumping ship, briefly charging the surrounding plasma. There were a few more, shall we say, unscientific hypotheses, but I brushed those aside. Eagerly, however, I put Iyen-Oursta near the top of my list of places to visit. Being based in Gallente space at the time, it was practically a hop, skip, and a jump away. When I got there, I had to admit a certain amount of disappointment. The gate, while a gorgeous example of Gallente architecture, showed no signs of these so-called children. There’s a small beacon a few kilometers off the gate, blinking in rather dull fashion, that dutifully broadcasts “Children of Light” to anyone in system, but Aura is oddly silent on the subject, offering absolutely none of her usual commentary. But I brushed off my disappointment: this was far from the first time that a hoped-for view had fallen through (Atioth, I’m looking in your direction), and it certainly wouldn’t be the last. 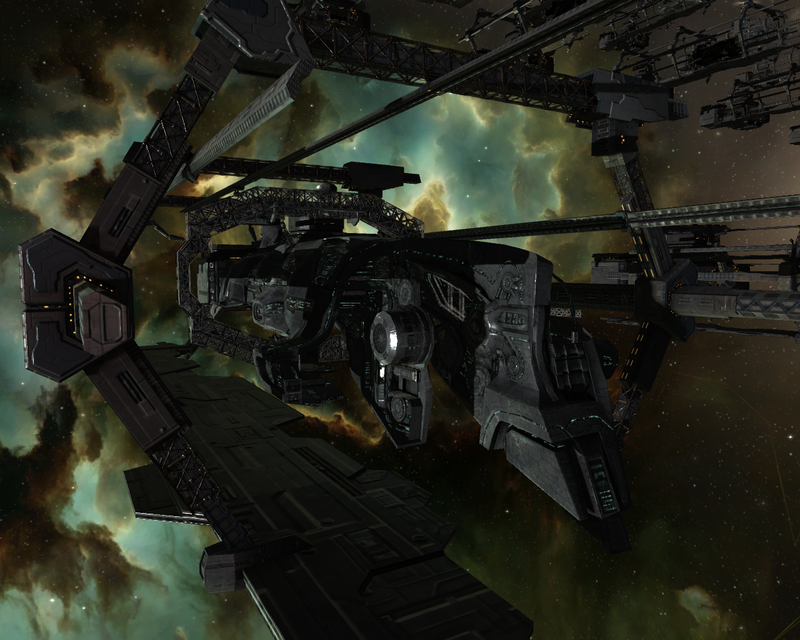 And besides, I had managed to find the aforementioned Roden Shipyards on the visit, so it wasn’t a complete loss. I made a mental note that this particular clue was a bust, and carried on my merry way. I’ve passed through the system countless times since then. As I jump in, my heart momentarily jumps as I see an unexpected beacon on my overview, and then as I read what it is, a twinge of disappointment again sets in. But I’ve learned to brush that aside as one of many things that are simply legends. Ghosts of stories from long ago. I was contacted out of the blue a few days ago by a pilot named Jon Tarant. I was over in Pure Blind on an unrelated research project, and was in the process of making my way through the never-ending piles of paperwork that always seem to appear whenever coordinating more than one or two people comes in to play. The unfamiliar name immediately piqued my interest. Jon initially asks me if I had ever heard of the Children of Light. I chuckled mirthlessly to myself, that twinge of disappointment once again tickling my brain. I replied that I was. Then he told me that he thought he had seen it. And not only that, but that he had a picture. Immediately, my eyebrows raised. My other projects were immediately forgotten. Before he had my curiosity, but now he had my attention. I immediately asked if I could see his photo. He dutifully obliged. It was not in the best resolution, and was clearly taken on the fly (pun intended). Having only just recently upgraded my own camera drones, I was able to sympathize. But the view itself. The view itself was astounding. The gate was immersed in a haunting blue glow. Tendrils of light went every which way, creating a complex lattice of light. I could see where the name “Iyen Pixies” had come from. Even from that image, I thought it was absolutely gorgeous. I hounded any and all details out of Jon, who happily obliged with what he was able to recall. I grilled him on his ship (Taranis) the date (March 10 YC 115), whether he was with anyone (a few in local). He said he had asked around the locals to see if anyone else had run into this effect. They all said no. He had a friend a few jumps behind him, also on his way through Iyen-Oursta. Jon asked his friend if he had seen the lights, the friend responded there was nothing on the gate. He had apparently filed away the information, and only when he happened across EVE Travel did he think to reach out to me regarding this discovery. I immediately ran over to Iyen-Oursta myself. Once again, I was presented with empty space beyond the gate itself, a few Gallente customs officials, and that accursed beacon with its steady blink blink blink, almost mocking me. No lights. No lattice. No children of light. Even now, I write this safely from the station in Iyen-Oursta. I have no doubt I will spend a bit of time here, trying to see if I can pull off what Jon saw. I have the means and willpower to test different approach angles, different ships, and other variables to see if I can trigger the Children, now that I know that they can be triggered. And that’s the key. Knowing that there was something out there to see. I had been lulled into a false sense of security, confident in my ability to root out anything that was hidden. I had grown overconfident. But this, this changes everything. Suddenly, the universe was new again. What else had I missed? What else had I brushed aside as unseeable? Sometimes it takes an extra set of eyes to remind you that one person alone can’t see everything out there. After all, sometimes the universe simply isn’t fair. Potential Hazards: If you’re below a -3 in security status, or -5 standing with the Gallente, you’ll have to deal with some rather unpleasant policemen. Additional Notes: Obviously, I haven’t confirmed this myself yet. I suspect that triggering the Children is simply a matter of chance (very very very very low chance). 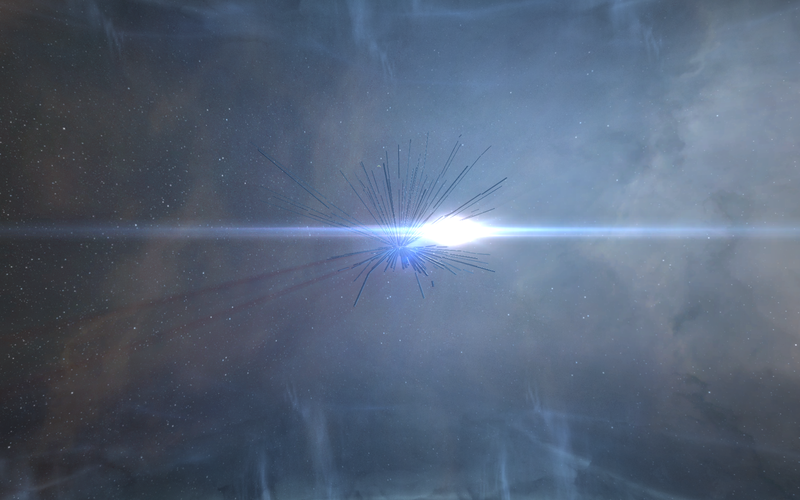 I’ve tried warp-ins from every celestial to no avail. If anyone else has a sighting of the Children, or any other info, please leave a comment here or message me. This is by far one of the more mysterious sights I’ve encountered in the game, and I find it fascinating! 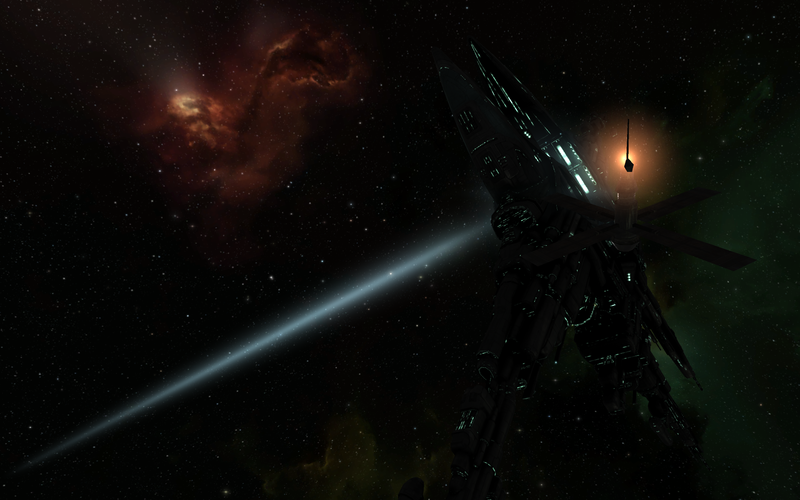 Stargates are remarkable pieces of equipment. 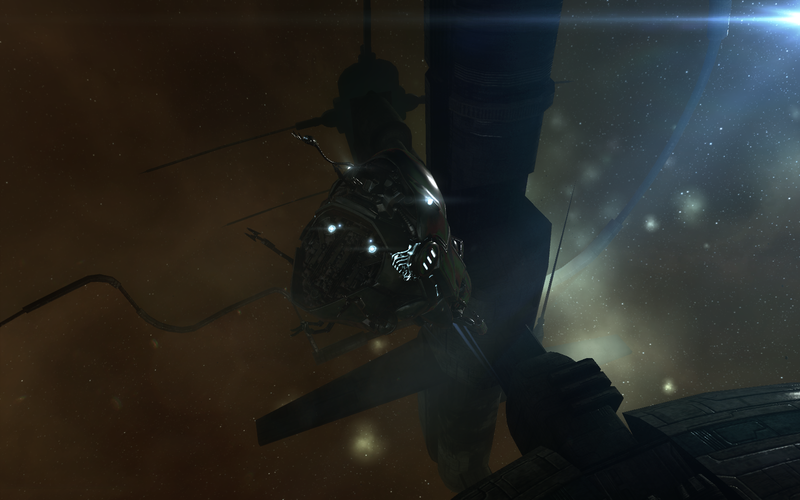 One moment, you’re sitting in Jita, minding your own business. 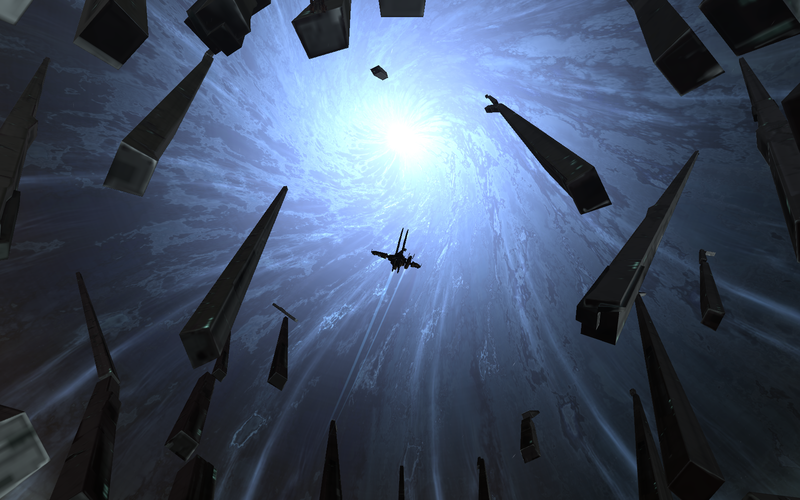 Then, the gate activates, and for a single moment in time, your ship literally disappears from existence. Where it goes, scientists have never quite been able to determine, but “the universe” is not part of that answer, at least for that split fraction of a moment in time when you’re traveling through the gate. And then, faster than you can blink, you suddenly appear 2.1 light-years away in Perimeter. That is an astounding distance. 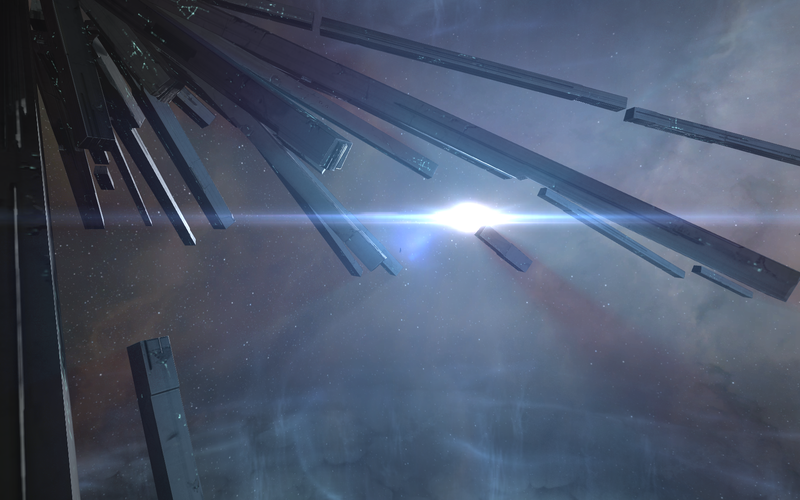 Light, that ever familiar benchmark, takes over two years to make its way to Perimeter. Even traveling at the standard 3 AU/second (roughly 1500 times the speed of light), a ship would take approximately 12 hours to travel that distance. But instead, thanks to the magic of stargates, we traverse that distance in less than a second. Although stargates can fling ships trillions of kilometers, this one will not be doing so anytime soon. Otomainen VII hangs in the distance. The mechanics of the gate are actually fairly straightforward, even though they may seem like magic to those who aren’t familiar with the underlying gate functions. Essentially, however, we learned (thanks to those civilizations that have come before us who left remarkably intact gates in the various homeworld systems) how to create artificial wormholes well before the “natural” variety began appearing after the Seyllin incident. 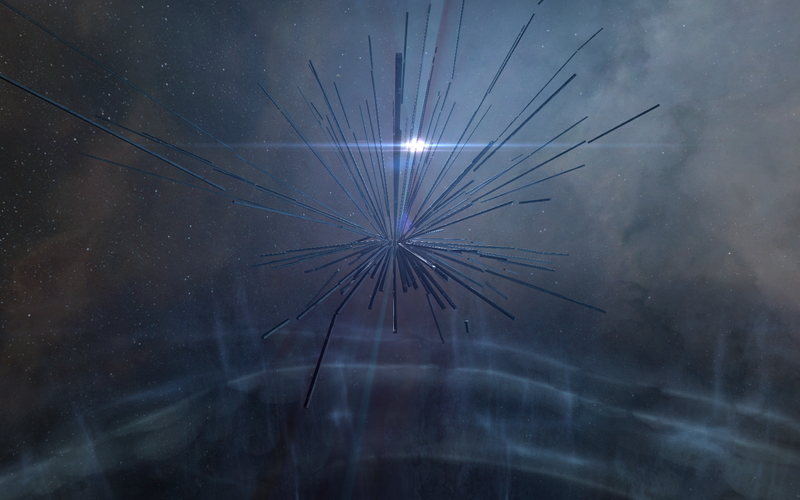 It turns out some areas of space are more susceptible to wormhole formation than others. Space where gravitational waves come together – so-called gravitational nodes – from two massive bodies (generally two stars are the only masses sufficient to form a long term stable connection) suffer from enough gravitational shear that it is fairly easy to “pierce” through the local spacetime fabric. If that hole happens to form while another one happens to form in a nearby system, the two rips are drawn to each other, and eventually the stargate can be formed and stabilized. 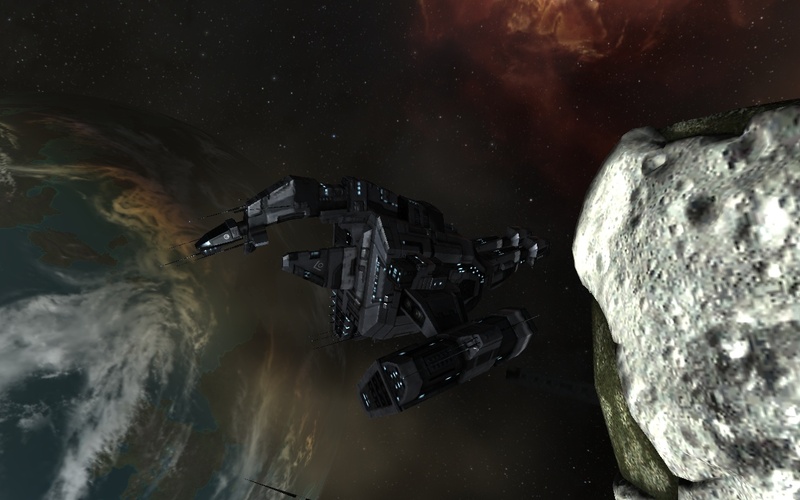 One of the mineable asteroids floats amongst the ruins of the rest of the site. This debris-cluttered field is yet another example of dashed dreams and dead hopes that litter the Okkelen constellation. While few would take succour from so desolate surroundings one can only hope that the souls huddled here at least take past failures to heart and strive to do better. Like survive. The area is indeed very cluttered. Space can rarely be defined as “claustrophobic,” but the Ranch is certainly trying its best to earn that particular title. The entire area is suffused with a rather dreary and brown dust cloud, perhaps the pulverized remains of some of the rocks brought in for construction of the site. Other asteroids can be seen nearby, some still with usable minerals for the odd capsuleer looking for a change in scenery from the ordinary asteroid belt. Although the dust clouds themselves are fairly dreary, they combine nicely with the backdrops near the Ranch. The dark blue of the Lonetrek nebula contrasts nicely with the reddish tones in Otomainen, giving the dust clouds an almost rainbow like appearance when viewed from the correct angles. Unfortunately, the “correct angles” are very narrow indeed, and in almost all other views, the grayish-brown dust clouds detract rather than add to the scene. A few denizens have also taken up residence near the Ranch, ready to offer missions to any that come their way. One of the few pieces of debris that can still be found near the site. 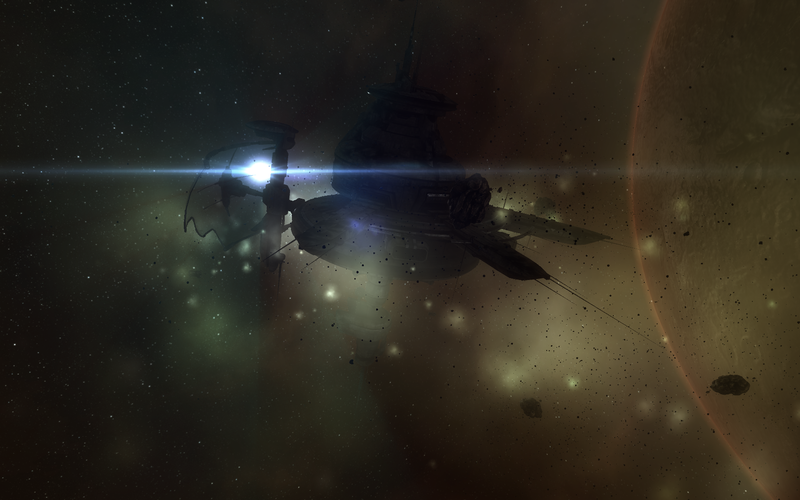 The Ranch is dominated by the abandoned ruins of a Caldari station. The age of the station isn’t entirely clear from scans, but given how quickly New Eden scavengers act, the station could be only a few days old to even decades. In any case, as usual, the station was picked clean of anything remotely approaching the realm of the “useful,” leaving nothing but the decaying hulk of the superstructure. More interesting to me, however, was the nearby remains of the stargate that formed the original basis of the site. Intriguingly, the gate is of Gallente design: the rotating rings contrasting sharply with the harsh utilitarian lines of the former Caldari station. The gate clearly has some power generators still active as well, as evidenced by the orange sparks parts of the gate gives off every few seconds. However, its companion gate, wherever it was, is probably just as dilapidated, meaning that the gate certainly won’t be returning to functionality soon, if ever. The remains of the settlement of the Ranch can be seen decaying off the left. I didn’t spend much time here. 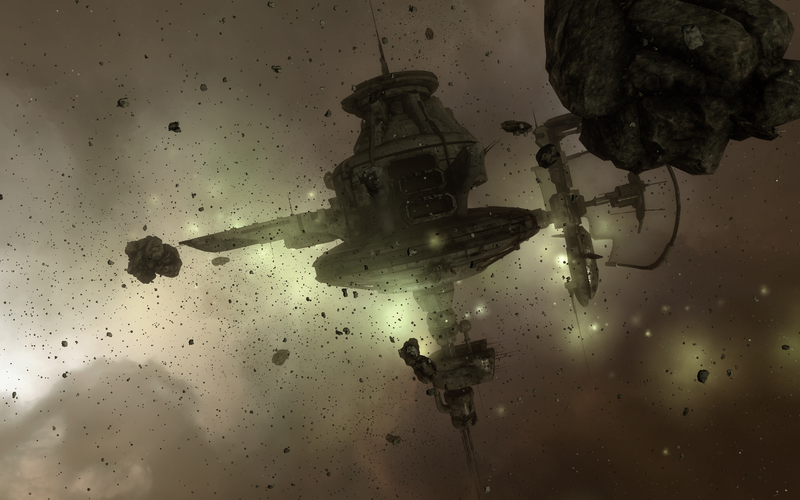 The site gave off a very sad, desolate feeling, despite the proximity of the area to the heart of Caldari space. The contradictions continued as the densely packed area felt empty. Not to mention that I didn’t want to particularly research which grisly end the original inhabitants of the Ranch came to. I contented myself with enjoying the many sites that the area had to offer before heading on. As I approached the gate to Ihakana, I wondered where the gate at the Ranch originally headed, and what became of the system on the other side, but figured it was probably best not to ask. Despite seeming near magical, it seems that stargates aren’t a panacea to all of our problems. Potential Hazards: If you’re below a -4.5 in security status, or -5 standing with the Caldari, you’ll have to deal with some rather unpleasant policemen.